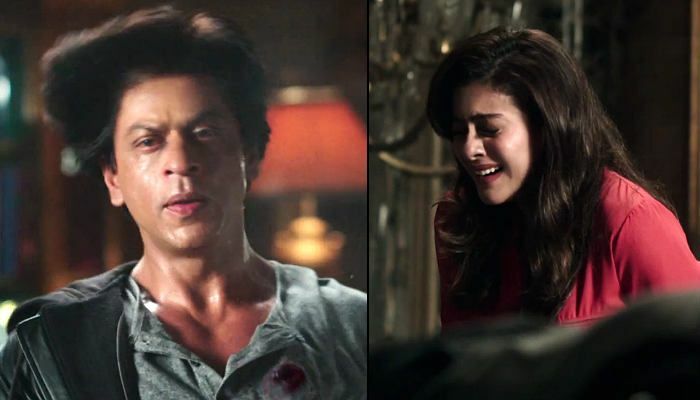 Home » Bollywood News » Dilwale: Do Shah Rukh Khan and Kajol die in the film? Dilwale: Do Shah Rukh Khan and Kajol die in the film? Bollywood actor Salman Khan posted a rather surprising video on Twitter on 11 December. The video is a peek into the two love stories in the Rohit Shetty's Dilwale - between Shah Rukh Khan-Kajol and Varun Dhawan-Kriti Sanon. But here's where things get interesting. In the two-and-a-half minute video, Shah Rukh is seen dying. In yet another shot, Kajol can be seen pointing a gun at him. Wait, what? It looks like Dilwale may not be all fun and frolic but may also have a dose of intense drama. Though the film is set to clash on 18 December with Sanjay Leela Bhansali's Bajirao Mastani, Dilwale seems to have built up quite the suspense to its release. The video is bound to cause heart palpitations to fans of the Shah Rukh Khan - Kajol pairing. What do you think?